This morning, as I was putting the final touches on my hair before I shoved a garden hat on top of my head, I noticed a tree frog watching me from the bathroom floor. 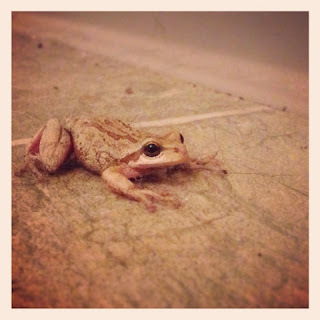 I carefully closed the bathroom door to keep Barnaby out and I snapped a quick shot of the frog on my phone. Then, I carefully moved the traumatized frog covered in hair and fuzz into my front garden. I released it on my new pollinator watering station. Just in case it wanted to rinse the fuzz off, take a sip of water, and snack on an insect. And the frog seemed relieved. We both moved on with our day. And I'm left wondering, how did the frog get into the bathroom? Any ideas?